"Asskizz Powergrudge (Payback! '94)" is one of those little goofs, oft-forgotten and probably for good reason. That does not mean it is is not a good song, or that it is not entertaining, because it is. The song could be considered scary, if A) it were not so cartoony and B) we did not know that this is not Beck's actual image/persona. Instead of being threatening, the song ends up being a novelty for these reasons. 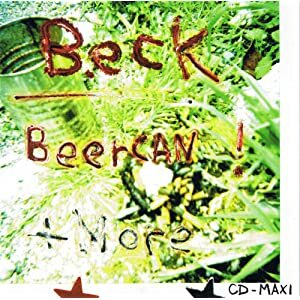 Beck's best songs mix a variety of song styles, and that is what makes this one musically interesting. "Asskizz" boasts a similar musical arrangement to the full-band grunge takes of "Truckdrivin Neighbors Downstairs" (heard on stage a few times), except it is acoustic. Acoustic grunge! Beck loads the song with some country bad-boy attitude, and tosses in some shotgun drumming and gangsta rap slang. Throw in an ending with bells, jackhammers, and other effects, and you get one crazy recording. In April 1994, during the very beginnings of the Mellow Gold tours, Beck actually played "Asskizz" solo acoustic on stage a few times! One was on a radio show in San Diego too, which hasn't surfaced. I'd be very interested to hear how this arrangement went. Before the song on June 11, 1994, Beck announces it's for the "MC Hammer payback tour!" and tells the crowd MC Hammer wasn't down with jacuzzis in limos. This version is pretty amazing, with some hilarious ad-libs ("I brought you a banana") and the band easily and expertly going from groove to metal from verse to verse. One early live version of "Asskizz" (June 29 1994, in Minneapolis) was probably the scariest thing I've ever heard Beck do. The novelty and subtle humor of the studio recording was replaced by a very dynamic arrangement with loud punky guitars. Each verse was sung quietly, and Beck ad-libbed here and there ("Just a gangster, just a gangster" and "Burnt out beyond belief, whizzing my teeth through the diamond lane, insane in the mundane"). After the calm verses, the song exploded as Beck shouted the chorus and his band thrashed. It was not nearly as subtle as the 4-track studio recording, and the irony feels as if it's been lost.